So this week I have seen about 5 people walking their dogs in this awful Texas heat! It was over 100 degrees when I saw these people walking their great pyrenees, another walking a husky, and a couple others were terriers. I wish I had the chance to stop and tell them what I thought, but we were on busy streets and no where to pull off. At what point did this seem like a good idea?? When you walked outside and thought “I literally think I’m in hell, come on Pebbles! Let’s go for a walk!”? Maybe it was when you felt the heat coming through your flips flops from the pavement, or got third degree burns from touching your selt belt earlier. It’s bad enough you take a short haired breed in this heat, but a Great Pyrenees? If I would have stopped and chatted with these fine, intelligent people I probably would’ve gotten a response like “This is the only time I have to go for a walk” or “I’m not hot, so they are fine!” I assure you, you can switch something up on your schedule later tonight to go for a 20 minute walk when it cools down. If you absolutely don’t have time when it’s cooler, go to the right of this page and inquire about our dog walking services! If you think just because you are not hot that they aren’t, then please go get a large fur coat on, take off your sun glasses, hat, sunscreen, and shoes and start walking on the molten lava you thought was a sidewalk. Chances are you won’t do that, so why make your poor dog suffer that pain? 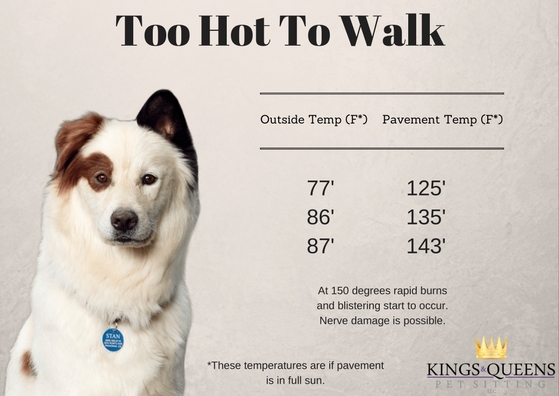 Here at Kings & Queens we don’t walk your dog over 90 degrees, because at 90 degrees the cement temperatures reach about 150+. If there are no sidewalks, just asphalt roads, those are even hotter! Even at 90 degrees if we are in full sun while walking, the dog can overheat easily just by simply being in that kind of heat for too long. We try to walk them in grass when it gets closer to 90 just so we don’t chance their feet getting too hot. In the temperatures I mentioned above seeing the other dogs on walks, the cement temperature was well over 150 degrees!! This temperature will cause rapid burning, blistering, and even nerve damage in a matter of seconds! 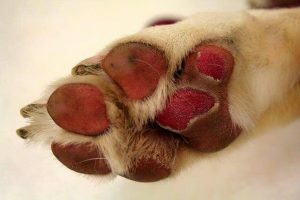 If you do have to walk your dog in heat well over 90 please take very short walks, take water for your dog, buy some booties for their feet, and look into some of these cool products, pun intended! Thought about shaving your dog to keep them cool? Please do not shave your dog it can actually make them hotter! I have created a little chart below that you can keep handy incase you forgot, Texas is actually 1,000 miles from the sun unlike the earth which is 92 million miles from the sun! Let us know below if this article was helpful to you!